Box Text: It's two player Double Dragon for you Sega System, just like the arcade game! In a city destroyed by war and crime, you count on each other to survive! You are Billy and Jimmy Lee, the twins they call the Spike and the Hammer. When it comes to martial arts, you're both street lethal. Leaping kicks, Knee smashes, Judo throws. You are the masters. Now get ready for the biggest battle of all. 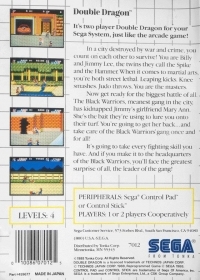 The Black Warriors, meanest gang in the city, has kidnapped Jimmy's girlfriend Mary Ann. She's the bait they're using to lure you onto their turf. You're going to get her back...and take care of the Black Warriors' gang once and for all! It's going to take every fighting skill you have. And if you make it to the headquarters of the Black Warriors, you'll face the greatest surprise of all, the leader of the gang! 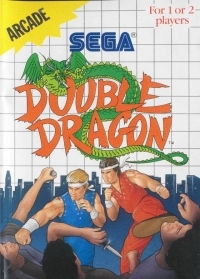 01-28-2016 Flashback2012 Box Text It's two player Double Dragon for you Sega System, just like the arcade game! In a city destroyed by war and crime, you count on each other to survive! You are Billy and Jimmy Lee, the twins they call the Spike and the Hammer. When it comes to martial arts, you're both street lethal. Leaping kicks, Knee smashes, Judo throws. You are the masters. Now get ready for the biggest battle of all. The Black Warriors, meanest gang in the city, has kidnapped Jimmy's girlfriend Mary Ann. She's the bait they're using to lure you onto their turf. You're going to get her back...and take care of the Black Warriors' gang once and for all! It's going to take every fighting skill you have. And if you make it to the headquarters of the Black Warriors, you'll face the greatest surprise of all, the leader of the gang! This is a list of VGCollect users who have Double Dragon (Red Cartridge) in their Collection. This is a list of VGCollect users who have Double Dragon (Red Cartridge) in their Sell List. This is a list of VGCollect users who have Double Dragon (Red Cartridge) in their Wish List.